Buddy is an attorney and avid sailor. He has loved all things nautical since making two Atlantic crossings on ships by the age of six. He spent his childhood on the waters of False River, a large lake near Baton Rouge, Louisiana. Throughout her life, Melissa has felt a strong connection to the water and spent many summers sailing and waterskiing on Louisiana's rivers and lakes. 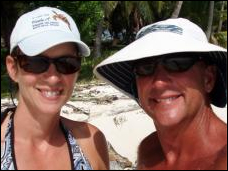 After numerous bareboat charter trips in the British Virgin Islands it became apparent that sailing vacations were simply not enough to satisfy our nautical souls. We set a goal to live aboard full-time and cruise for at least two years. The acquisition of Indigo Moon, our Lagoon 380, culminated a three year search: We wanted a catamaran large enough to be ocean seaworthy and entertain guests comfortably, yet small enough to be easily single-handed when necessary. When the Catamaran Company in Fort Lauderdale, Florida, showed us Indigo Moon we instantly knew she was the perfect choice for us. Once we had possession of Indigo Moon, we brought her to New Orleans where we kept her docked at South Shore Harbor Marina on Lake Pontchartrain. We then spent the next three years preparing ourselves and the boat for our journey. 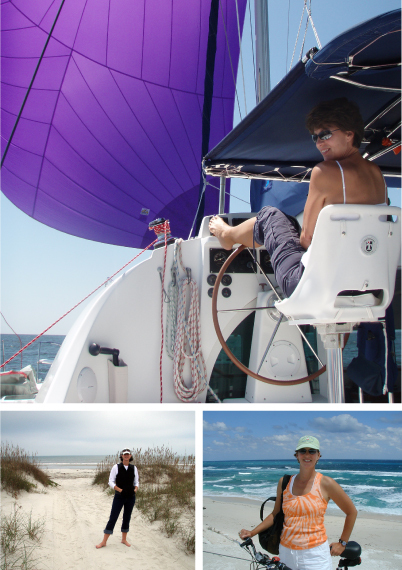 We spent most every weekend on Indigo Moon and developed a close relationship with the catamaran which would ultimately become our vessel as well as our home for six years. In the meantime, we both became U.S. Coast Guard six-pack licensed captains. The sailing experience we gained on Indigo Moon before departing as well as studying for our captain's licenses would serve us well in the years to come. Our adventures officially began on January 1, 2005, when we untied Indigo Moon and departed from New Orleans, Louisiana. As of December, 2009 we have traveled over 17,000 nautical miles on Indigo Moon. We have crossed the Gulf of Mexico twice, explored virtually all of the Bahamas, cruised the U.S. East Coast twice as far up as Massachusetts, sailed 1130 non-stop ocean miles on a seven day passage from Ft. Lauderdale, Florida, to the Virgin Islands, cruised the entire Eastern Caribbean archipelago from the Virgin Islands down to Grenada, explored the northern coast of South America, including Venezuela and Colombia, crossed the Caribbean Sea twice, and toured Central America including Panama, Honduras, Guatemala, Belize, and Mexico. 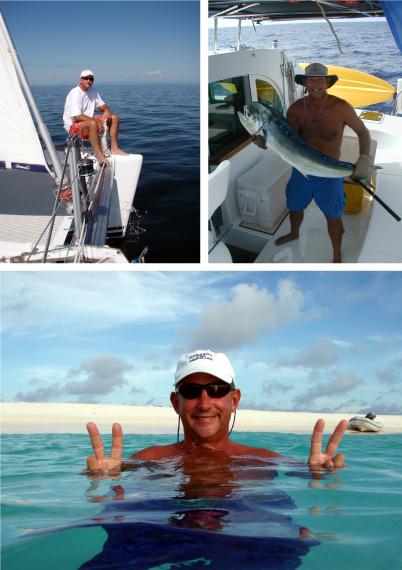 Our full-time hands-on experiences have served to hone our skills in offshore sailing, yacht maintenance, fishing, SCUBA diving, and all aspects of the active cruising lifestyle. We enjoy sharing our experiences and eagerly encourage others to cast off lines and experience the unparalleled adventure of full-time cruising. 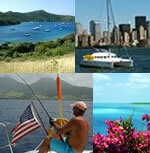 People ask us: “How could you do such a thing - quit professional careers midstream, sell your house, and just sail away? Wasn’t that scary?" Buddy often writes about their adventures. 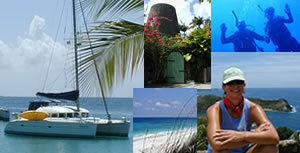 His articles have been published in SAIL, Latitudes and Attitudes, and the Caribbean Compass. Also, Melissa has created and maintains the Indigo Moon website where Buddy writes trip logs that chronicle our adventures. The content begins with our purchase of Indigo Moon and goes from there, taking readers along with us for the entire journey. And don't worry. We don't want, nor do we have any sponsors. There is no cost to join our list. We don't do anything with our reader e-mail list except mail out Indigo Moon web site update notices and that is it. So, you can add your e-mail address to our database and not worry about a thing. Finally, please feel free to contact us directly if you ever have questions or comments, or simply wish to share your love of sailing and the sea with us.